In addition to being an introvert, I am also an empath. This means I sometimes knowingly, and sometimes unknowingly, pick up the energies and emotions of others. Being an empath can feel exhausting and overwhelming for some, and it has felt that way for me for most of my life. For all these reasons I thought that being at a national march was a ridiculous idea for me. Why would I knowingly and willingly place myself in the middle of a huge group of people who are feeling sadness, anger, frustration and other strong emotions? Why would I willingly be in a group, most likely standing in close proximity to many others, with no opportunity to move to a location by myself? Shortly after hearing about the march, I began to hear the passion in the students’ voices and in their messages. I listened to my student-clients and heard their passion and frustrations as well. Soon, the calling to be at the march in support of our youth was greater than the assumed discomfort of me being there. I recognized the call, and this knowledge helped give me strength. Thus the trip was planned. Even on the plane the day prior to the march, the shifts of collective energy were apparent. There was a reporter and her cameraman seated near us. Next to the reporter was coincidentally (or synchronistically) a 17-year-old teen whose family’s connecting flight took them through Detroit. This teen was one of the Marjory Stoneman Douglas high school students who was scheduled to speak. When it was time for everyone to leave the plane, there was no rushing or pushing. In fact, we who sat in the back of the plane, just relaxed in our seats until the rows in front had sufficiently cleared. The flight attendant said that in her 18 years of service she has never seen such a calm, polite, respectful group of passengers. We think it’s because so many on that flight were arriving in DC to represent the larger value of social responsibility and social consciousness. We arrived at the march 90 minutes before the event was due to begin. The number of people already there was, to no one’s surprise, huge. All of us began slowly making our way in the direction of the stage. Although there were smiles everywhere I briefly worried, “What was I thinking? This will be hard enough during the march itself when everyone is here and there are wall-to-wall people. There is still so much time for me to overwhelm before it even begins.” If you are also an empath/introvert/Sensitive you may relate to those thoughts. However, I quickly put into practice for myself the suggestions that I offer to others: I returned to the present moment and stayed out of story, thereby keeping my thoughts to what was happening right then. Not surprisingly, I did not spin into worry. Instead I enjoyed what I love best. I love people watching and many of the signs that the participants carried were creatively composed. It was great to see teens, families and little children, alongside the baby-boomers like myself. We were all together, all sharing a common purpose. I found that walking with, and standing near like-minded individuals was exhilarating. The energy at the event was palpable. And this was before anyone even came to the podium. The speakers – our youth – articulately and passionately shared their deepest desires along with their greatest fears. They encouraged us and rallied us with their strength and through their tears. And we responded in kind with cheers, tears, and a cascade of emotions that included hope, frustration and strength. We were (reportedly) 800,000 yet we were one: one voice, one passion, one message that insisted that we find a way for our youth (everyone actually) to feel safe in schools and in their lives. 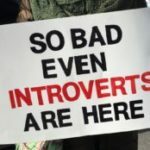 If you are wondering how this Introvert (Sensitive/Empath) was so successful, I admit that it has been a fascinating journey. It has included a fearless look at my worries and my fears, learning what tools work best for me to help me to process my emotions and the emotions of others, energy modulation so my empathic skills work in moderation, keeping my heart open, and practicing grounding exercises. May you each find the peace that you wish, to go where you need, so that you may continue to make a difference in the world.